Spectral scalars can enhance the geologist’s understanding of crystallinity changes, alteration pattern shifts and geochemical conditions. 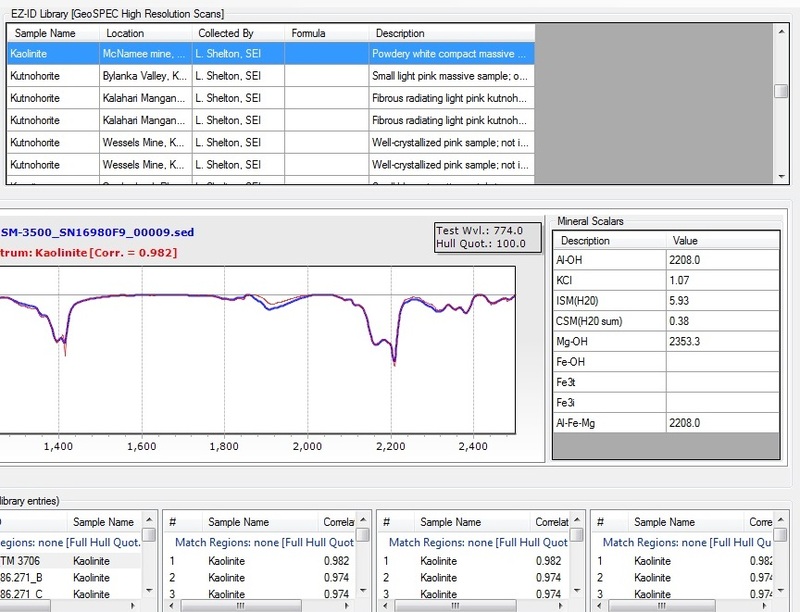 EZ-ID now supports spectral scalars for Al-OH bonds, kaolinite crystallinity (Kx), illite spectral maturity (ISM), chlorite spectral maturity (CSM), Mg-OH bonds, Fe-OH bonds, Fe3t (mineral type), Fe3i (mineral intensity), and Al-Fe- Mg bonds. The Al-OH absorption feature at 2200nm wavelength position provides indication of geochemical conditions at the time of alteration. 2160—2240 wavelength variations. Kaolinite crystallinity influences the shape of the Al-OH feature. A Kx greater than 1 indicates kaolinite produced by weathering; less than 1 is associated with kaolinite produced by high temperature alteration events. The lower the Kx, the higher the formation temperature. Values greater than 1 indicate a low grade metamorphic illite; less than 1— illites produced at higher temperatures. Values greater than 1 indicate a low metamorphic grade chlorite; less than 1 are chlorites produced at a higher temperature alteration event. The wavelength position of this feature near 2350nm indicates geochemical conditions at the time of alteration. The wavelength near 2260nm position of this feature indicates geochemical conditions at the time of alteration. Hydroxide-type Fe+3 minerals typically have Fe3t values greater than 900nm; oxide type Fe+3 minerals have vales less than 900nm. The higher the Fe3i value the more intense the FE+3 absorption. Reports the wavelength of the deepest absorption feature of these three. Features centered in 2160-2370nm range. Scalars are automatically part of the EZ-ID mineral identification screen. They provide information that can enhance a geologist’s understanding of geochemical conditions at the time of alteration. 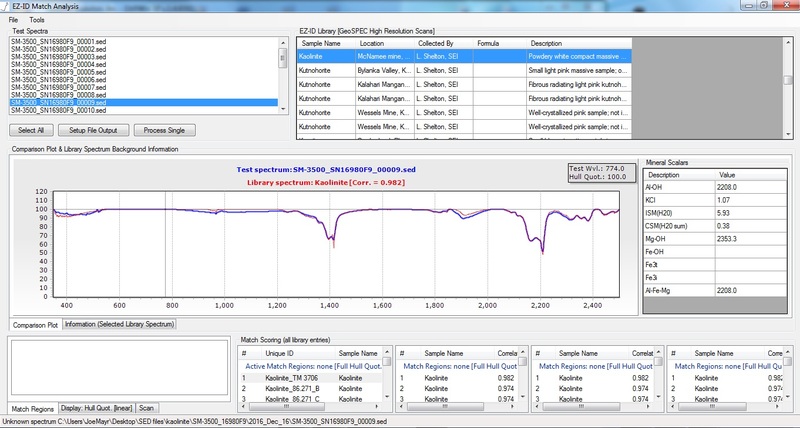 EZ-ID software provides scalars to enhance mineral identification and better understand alteration. oreXpress spectrometers for mining provide a fast return on investment with accurate collection of data in the field plus fast mineral identification. For more information on the oreXpress, click here. Download our Mining Brochure about our field portable spectrometers for mining. 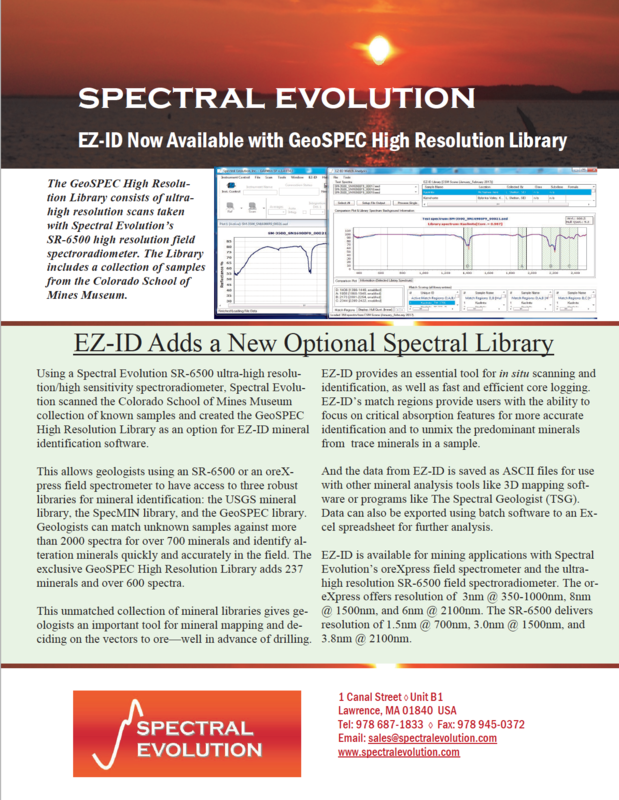 Download our SR-6500 Brochure about our ultra-high resolution field portable spectrometers for mining..
Download our GeoSPEC library flyer for more information. For more information on EZ-ID and our Library Builder module, download our brochure. 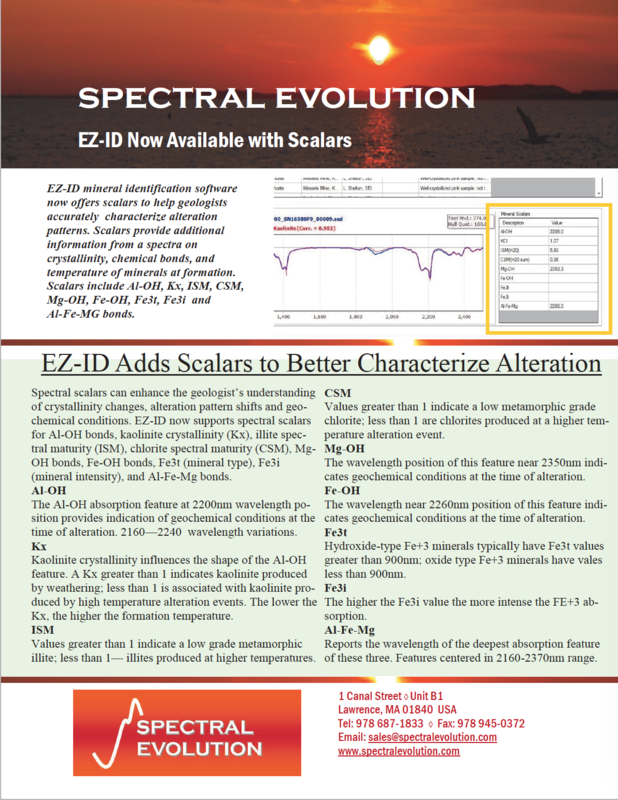 Download our EZ-ID and and scalars flyer.